This is a gorgeous pendant necklace with a large mosaic inlay pendant of geometric designs made from individually hand-cut tiles of Kingman turquoise, orange & purple spiny oyster, jet, white clam and mother of pearl. The mosaic tiles are inlaid on a foundation of green serpentine. The large pendant hangs from an oversized bale made with a round bone used as the foundation of its inlaid mosaic work. 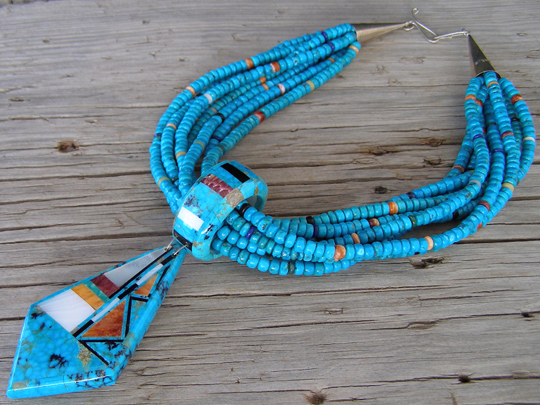 The large-bale mosaic inlay pendant is strung on eight strands of handmade rolled beads of Kingman turquoise sprinkled with beads of various colors to complement the inlay work. The photographs shown here accurately represent this necklace, but they cannot show or tell its full beauty, nor relate the comfort of wearing it. The strands are just 18 1/2" in length; it's a choker necklace that rides high so that the pendant hugs the sternum and never swings, but rather holds fast to you. CTN (for Christopher Thomas Nieto) and SDP (for Santo Domingo Pueblo Pueblo) are incised in the serpentine stone foundation on the back side of the pendant. Top edge of bale to bottom edge of pendant: 4 5/8"